The activities of the week opened on Wednesday, 20 March with a reception held at the European Parliament and hosted by Jeppe Kofod, MEP, who spoke about the need to remain optimistic about the growth of the EU-US economy. He emphasised that transatlantic leadership is critical if we are to address our shared issues, and by working together we can reinforce global standards and promote our common values. The reception served as a launch of the Transatlantic Economy Report 2019 which includes the latest facts and figures about the EU-US economic relationship. This year’s edition features new inserts on topics such as Brexit and the transatlantic trade and investment landscape. In addition, our new interactive platform Thriving Together, was launched. The site highlights the deep link between the EU and the US by showing how each European country or US state benefits from the relationship, reminding us that while the Atlantic separates us, 16 million jobs bring us together. The week culminated with the Transatlantic Conference on Thursday, 21 March, with panels and speeches by top government and business leaders including: Klaus Iohannis, President of Romania, Cecilia Malmström, EU Commissioner for Trade, Karl Brauner, Deputy Director-General, World Trade Organization, Didier Reynders, Deputy Prime Minister of Belgium and The Hon. Gordon Sondland, US Ambassador to the EU who gave lunchtime keynote remarks. Additionally, two panels on ‘the state of transatlantic ties’ and ‘the future of the global trading system’ gave insightful views from the EU and US as well as the wider global context. The message from all speakers was one of optimism about the future of the EU-US economy, reiterating that despite facing challenges, the transatlantic relationship is unshakeable and that cooperation – not competition – is key to future growth. In addition, AmCham EU was also honoured to welcome colleagues from across the AmChams in Europe network for the annual Brussels Briefing. This included a three-day programme of policy briefings from the Secretariat as well as a closing lunch with Ann Mettler, Head of the European Political Strategy Centre (EPSC), European Commission. 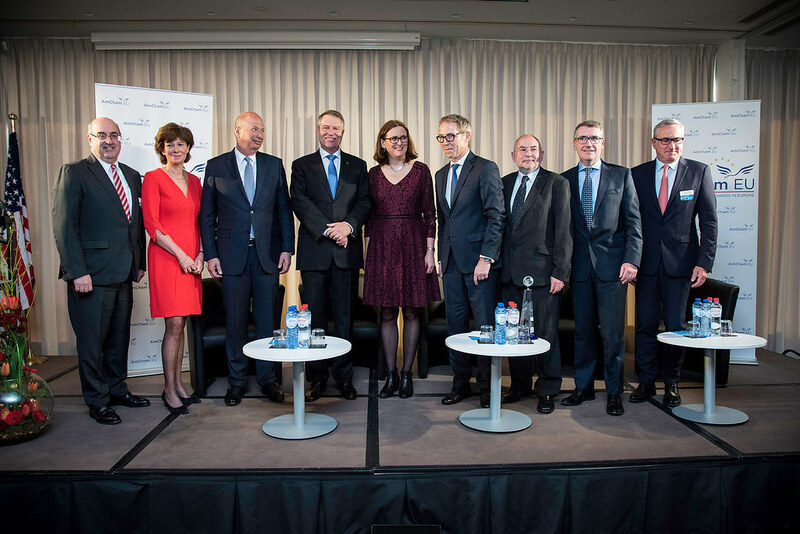 Finally, AmCham EU is delighted to announce that the Transatlantic Business Award 2019 was presented to Cecilia Malmström, EU Commissioner for Trade, in recognition of her commitment to strengthening the transatlantic economy throughout her tenure in Brussels. The award recognises an individual who has demonstrated exceptional dedication to the pursuit of a strong and prosperous EU-US relationship.